In classic French cuisine, one of the standard kitchen positions is called garde manger, which translates literally into "guard of the food." Among other things, the Chef garde manger is responsible for taking significant leftovers, such as an excess of lobster, and turning it into a cold dish to be served again another day in different form. 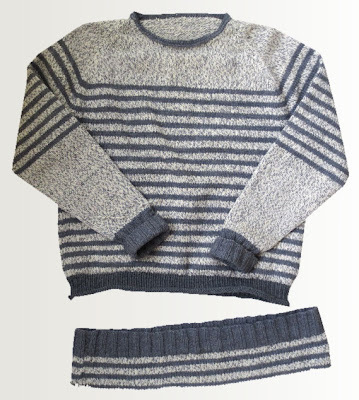 In knitting, when a garment has come to outlive its original purpose, I think there should be a garde tricot--a guard of the knitting--who reworks the knit garment into something which can be worn again another day. Although this sweater was much worn in its day, the person-for-whom-it-was-made and I eventually parted company (but not before I got the sweater back!) For many years, it sat in a cedar closet. Finally the time came when another person came to want to wear it. However, in its original state, it was too long and the neckline did not suit. 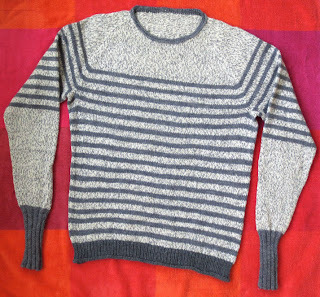 The sweater was made so long ago, there was no hope of finding excess yarn in stash. The unraveled yarn therefore had to be de-kinked and re-used. I snipped a single stitch at the edge of the neck and, as shown above, unraveled the yarn down to the point where the new neck edge was to begin. I put the loose stitches onto a knitting needle to re-knit the neck. At the bottom, I removed the excess length: I snipped a stitch, then unraveled in both directions, catching the stitches onto a needle. Above, you can see the new neck and new bottom band, together with the excess length, now removed. The neck is a perfectly standard crew neck. 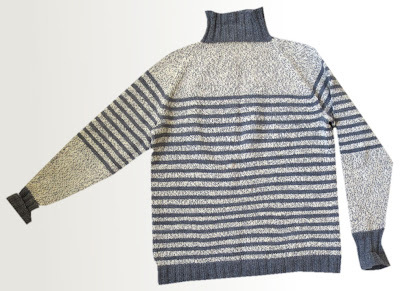 The back of the garment was raised by doing three series of short rows: one stretched from front shoulder seam around the back to the other front shoulder seam; the second and third stretched from the back shoulder seam across to the other back shoulder seam. This raised the back of the garment 6 rows (just over an inch) above the front. 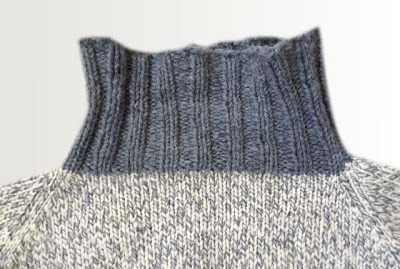 Combined with the bottom the neck opening being lowered, the front-to-back differential supplies the neck shaping so sadly lacking in this sweater's first life. Round 16: bind off with a chain bind off, using the "OK" alternative for the last stitch from the post about circular binds off. 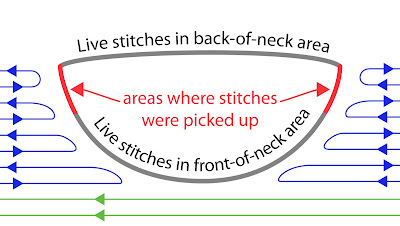 To knit the neck above the bottom of the opening, I worked around-and-back, meaning that I actually worked flat, knitting there and purling back, as shown by the below schematic--the green lines show the original circular work, the blue lines/arrow show the short rows at the neck edge. At each neck edge, rather than decreasing stitches, I held all the stitches live. In other words, in the gray front section, I did not bind off as I worked the neck, but transferred all the center-of-of-the-neck stitches onto a scrap piece of yarn, then added additional live stitches at each neck edge as I came to them via short row, rather than binding them off. In other words, if you think about it, what I was really doing at the neck edge was knitting short rows--each of those blue rows got a little shorter as more neck-edge stitches were transferred to the holder, there to join the live stitches from the previous rows. Each time I came to the neck edge from either side to drop off more stitches onto the holder, I worked a wrap-and-turn. Once all the stitches for the neck front were decreased (ie: transferred to the scrap yarn) and the neck line finished, I had the back-of-the-neck stitches live (gray on above schematic) the front-of-the-neck stitches live (gray on above schematic) and a stretch between them (red) where the fabric edge (straight part of the curve of the neck) showed, but there were no live stitches. Along this straight red part, where there were no live stitches, and using light gray yarn, I picked up stitches through this fabric edge at what seemed to me an appropriate rate. I then had live light gray stitches all the way around the entire neck. The wraps from the wrap-and-turn stitches were lifted off the underlying stitches and knit together with them. The only exception is that, about a quarter of the way up the curve of the neck on both sides, instead of lifting one of the wraps and knitting it together, I used this lifted wrap as if it were a free-standing stitch. This added a little ease along the curve. In other words, this trick added one extra stitch at the sharpest part of the curve on each neck-side, and this was done to prevent puckering. 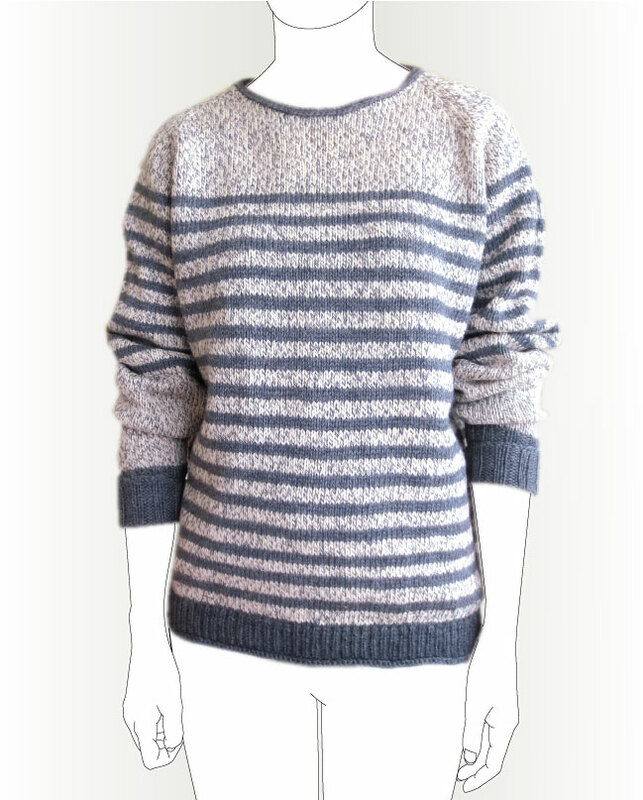 As shown below, the bind off was worked so as to leave the dark gray chains showing on the sweater surface. 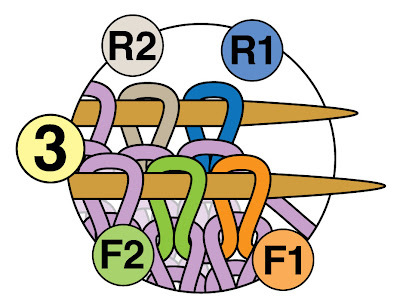 These chains are shown by the bottom double-headed red arrow. I then picked up new stitches THROUGH the bind off by holding the yarn on the outside of the garment and drawing a loop UP (towards the neck hole) through the chain bind off--one loop into each chain, with the loops drawn up in such a way as to leave the entire chain exposed on the surface. 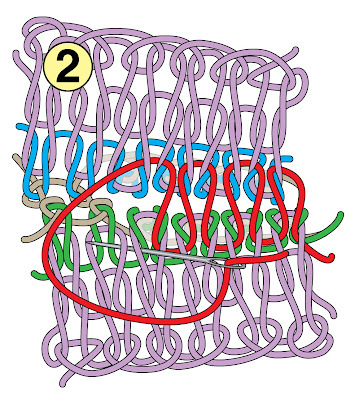 The thin red lines show the method and direction in which the loops were pulled up: the dotted portion is the part of the loop which passes through the chain, the top part of the loop is the actual picked-up stitch, the bottom part of each loop hides between the chains of the bind off. Once I had live stitches all the way around, I knit a short band (4 rows high) then worked a purl round to make a nice sharp fold-edge, then three additional rounds on the inside for a facing. (In the finishing process, the live loops at the bottom of the facing are pulled down so long on the inside, that you really do need at least one fewer rounds on the inside of a facing than on the outside. Having fewer rounds on the inside of a facing also helps prevent the facing from rolling outwards). 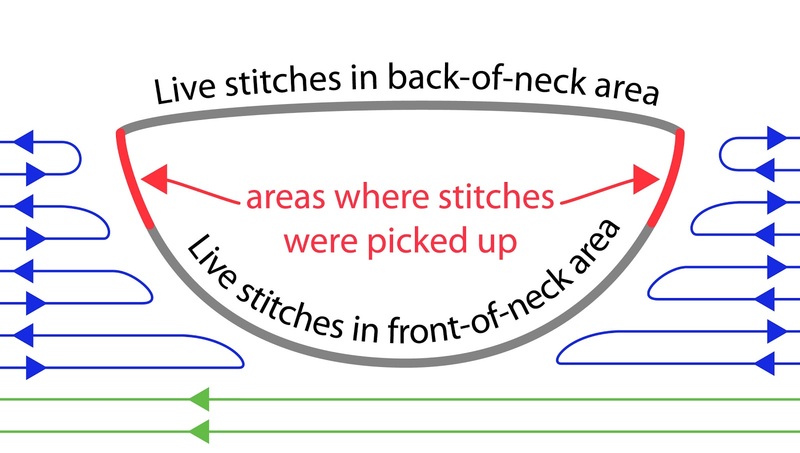 The live stitches of the facing were tacked (sewn) down to make a hem inside the garment, using the overcast stitch: one stitch for each live loop. If you go to try this yourself, the situation seems like an impossible mess, with the inside of the facing at least twice as wide as the fabric you are trying to tack it to. However, as you tack each stitch down, the mess lessens. The final result, contrary to first expectation, is quite neat and tidy, as shown below. The grand finale of the neck edge was to take matching sock yarn and adapt my "neat little edging" in slip stitch for the ribbing around the neck, matching the chains of the edging to the direction of the chains in the chain bind off. 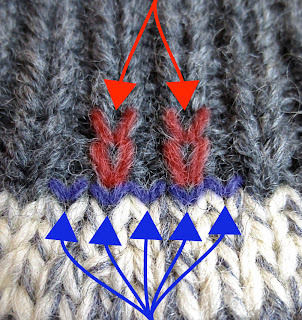 The sock-yarn edging is shown by the top double-headed red arrow two illustrations above. Again, this was to reinforce the neck in preparation for the inevitable neck-tugging in its future, again, this had to be done loosely. The last step was to wash and block the garment. I blocked it quite a bit longer and narrower, but still substantially shorter than the original. In truth, if I'd had my wits about me, I would have blocked it BEFORE I knit on the new neck and bottom bands: bands don't need to be blocked and brand-new bands are delightfully elastic. Oh well, I'll try to remember to block before knitting the bands the next time I rework an old sweater (although there are fewer and fewer in that closet, as more of the old sweaters escape). Ooo--I'm wrong again, there was one more step: like many old garments, this sweater had developed some holes, as shown to left. Worse, it had mysteriously become stained. The yarn was weakened over the stained area--evidently the stains ate away at the yarn. 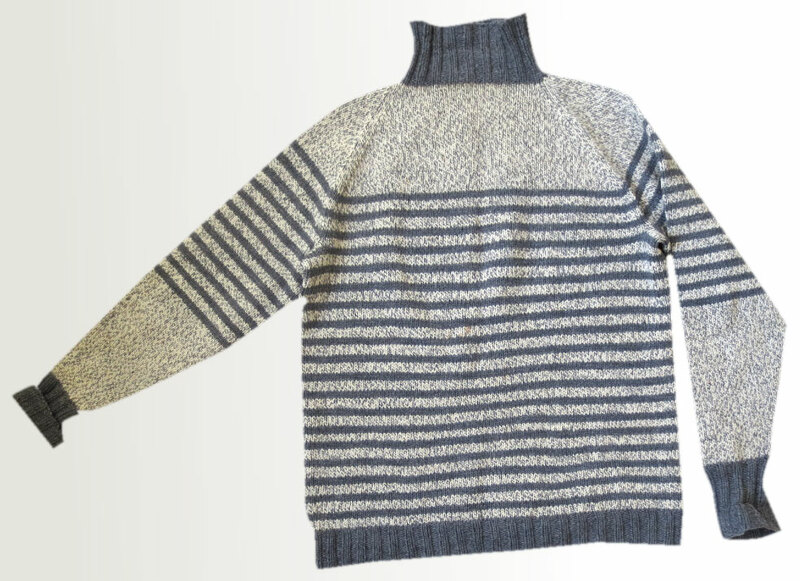 I spent an hour or so with a dull-pointed needle and some reclaimed yarn, duplicate stitching over the holes as well as over the stains, so that the stains did not become holes as the sweater was worn. Also, reinforcing the stained areas made it possible to give them special attention when washing, whereas if these areas were not reinforced, the special attention would have shredded the already-weakened yarn. Once washed and blocked, the stains lessened and the duplicate stitch flattened down. As shown to the right, only in extreme close-up can you really see where the duplicate stitching was done, and only because the garment hasn't been worn much in its new re-worked state. Over time, even that residual uneven-ness of the columns will straighten out. A tiny bit of the stain still shows, so you can tell what it looked like before the duplicate stitch--click on photo to enlarge, stain peeks out at lower center. 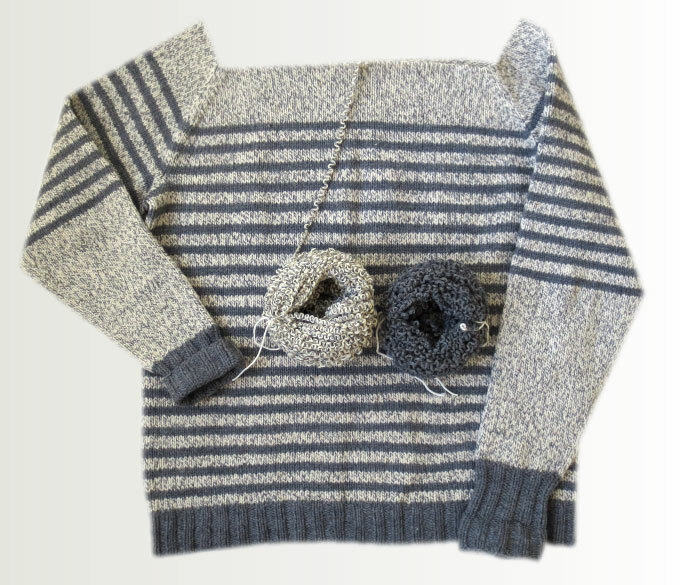 Back in 2007, TECHknitting blog showed how to de-kink yarn, but time does not stand still. In the intervening years, a newer INSTANT-steam method has come into use here at chezTECH. The old post about de-kinking yarn has been updated to reflect this new trick, but it seemed worthwhile to note the update in a new post, too. You can actually see the kinks relaxing right out of the yarn, and seeing is believing. 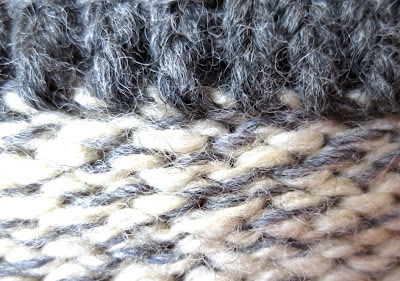 For verrry stubborn kinks, where steam-de-kinking does not work, you can go back to the 2007 post and have a look at how to de-kink yarn the old-fashioned way, by wet-blocking, but do try this instant-steam method first! This is part four of a four-part series on grafting (Kitchener stitching) hand knits with a sewing needle. The first three parts are already on-line (part 1, part 2, part 3). Because this is part of a series, the numbering of the illustrations is sequential. This post contains only illustration 9. Illustrations 1-8 are in the previous installments. 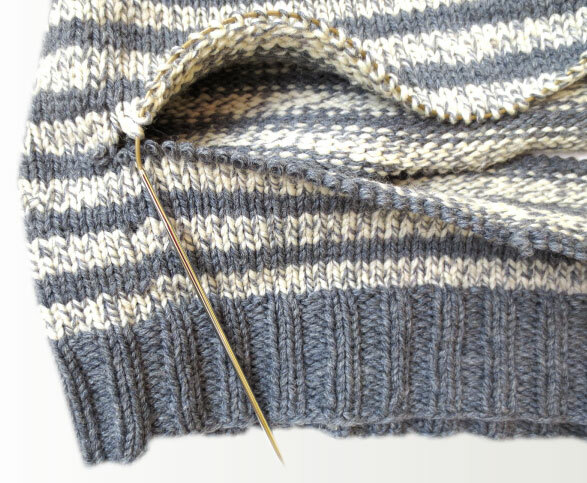 It is possible not only to graft a seam with the Kitchener stitch, but even to do shaping. One common place this might come in handy is at the “donkey ears” on either side of a sock toe. Another place this might be very useful is when grafting uneven numbers of stitches together. In illustration 9, a decrease (orange) is being worked every third row on a sock toe. 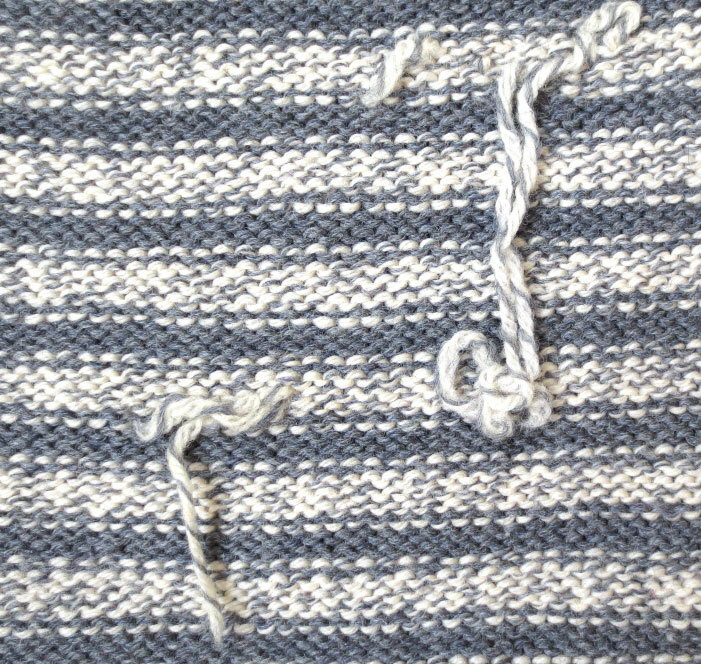 The final decrease is being done on the Kitchener stitched grafting row: the first two stitches on the front needle are being worked together as a single stitch, while the neighboring stitch to the left (which would be worked next in the Kitchener stitch sequence, as discussed previously in this series) would be worked normally (as a single stitch). You would then work the first two stitches on the rear needle as a single stitch, while the neighboring stitch to the left, which is worked next in sequence, is worked normally, as a single stitch. Obviously, the last three stitches on each needle would get a matching treatment, with the very last 2 stitches on both front and back needle worked off as one. If your decreases are not made at the very edge of the fabric, you can just as well do this trick of working 2 stitches together as one, at any place as appropriate along the grafting row, in order to keep your decreases aligned. However, if you're grafting socks, decreasing on the very edge of the toe as shown will eliminate the dreaded "donkey ears," because the decreases lock the (loose) first and last stitches away from the edge. This trick of working 2 sts together as one also works when you need to graft uneven numbers of stitches together. 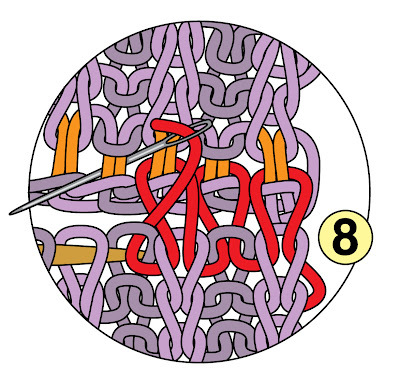 On the fabric with more stitches, do a decrease-while-grafting, as shown above, while on the fabric with fewer stitches, simply graft each st individually. In this manner, you can get rid of quite a few extra stitches from one fabric while grafting it to another, narrower one. This is part 3 of a 4-part series on grafting (Kitchener stitching) hand knits with a sewing needle. The first two parts are already on line (part 1, part 2). Because this is part of a series, the numbering of the illustrations is sequential. This post starts with illustration 7. Illustrations 1-6 are in previous installments. 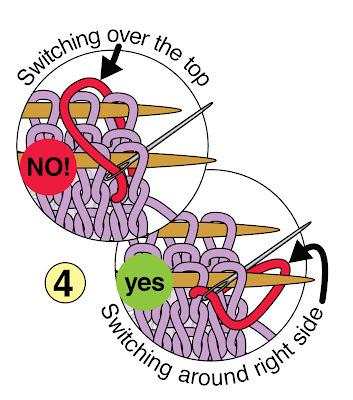 Ribbing: Grafting ribbing head-to-head is problematic. You see, the head and the tail of any knitted stitch are 1/2 stitch offset. For row-structured fabrics such as stockinette or reverse stockinette, or garter stitch (row-structured = same stitch all the way down any given row) this 1/2 stitch offset only shows at the beginning and end of the graft. In other words, in row-structured fabrics, there IS a 1/2 stitch offset, but it only shows along the very edge of the fabric, where it can easily be hidden in a seam. By contrast, in a column-structured fabric like ribbing, the 1/2 stitch offset caused by grafting live stitches head to head shows at every transition from knit to purl—in other words, at every rib. Not pretty, as you can see from the closeup in illustration 7 (red yarn = the graft). 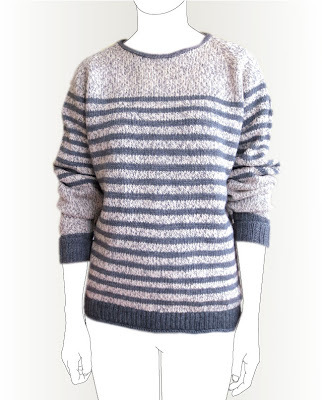 In truth, there is no way to actually solve this problem: it is a structural problem inherent in the knitting itself. However, there are two pretty good tricks to disguise the offset, and those are the subject of today's post. 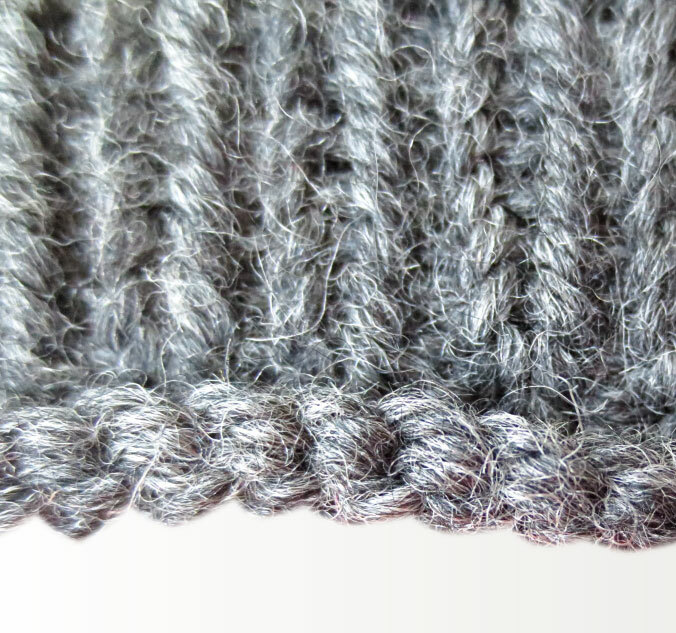 Ribbing and double knitting are actually close cousins. If you've ever done a tubular cast on for ribbing, you've worked a set-up tube of double knitting topped by a ribbed fabric. Same thing with a tubular bind off: that’s a ribbed fabric topped with a double-knitted tube, then grafted shut. We can use this handy relationship to graft ribbing. The downside: it’s not stretchy. The upside: it’s easy and visually excellent--in fact, if you maintain a good tension so the graft looks like the surrounding stitches, this graft is completely undetectable--until you try to stretch the fabric, that is. To work this trick, you re-arrange all knit stitches of the first piece onto a knitting needle, while all the purl stitches get put onto a holder held at the back. Repeat on the second piece. Here's the trick: Ignore the purls on their holders! 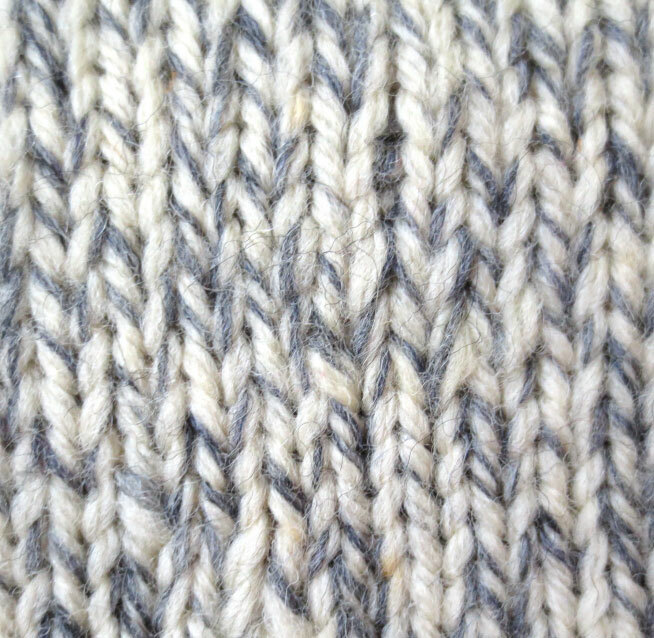 Instead, simply graft all the knit stitches on both needles together as for ordinary stockinette fabric. 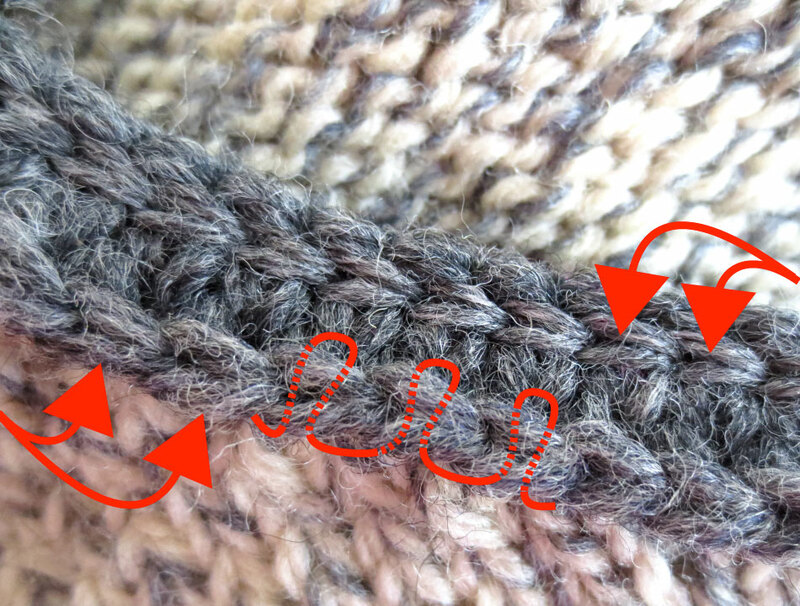 If you already know how to graft (Kitchener stitch) great: if not, try this method using knitting needles, or this method using a sewing needle. When you get to the end of the row, turn the fabric over, and slip the used-to-be-purl stitches from their holders (they'll now look like knits since you flipped the fabric). 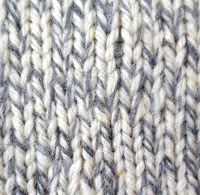 Slip these held stitches onto knitting needles and again graft as for a stockinette fabric. Although this "one-side, then the other-side" trick is not stretchy, its actually a good choice for the top of a ribbed mitten, the top of a ribbed hat or the back of a ribbed collar where the ribbing comes together head-to-head. This is also a good choice for a shoulder seam where stretchiness is not wanted. 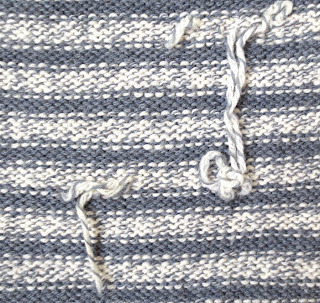 However, check the width on a swatch first: ribbing grafted this way is frozen into its fully-retracted, most 3-d position, which may be narrower than you expect. 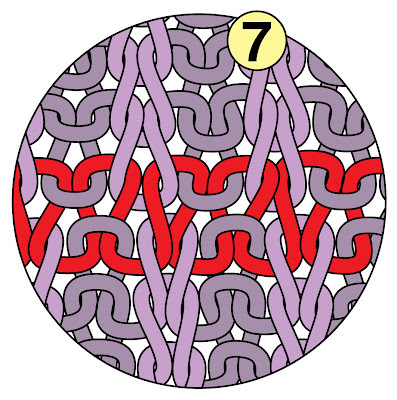 This trick is usually used on a 1/1 (k1, p1) ribbing. 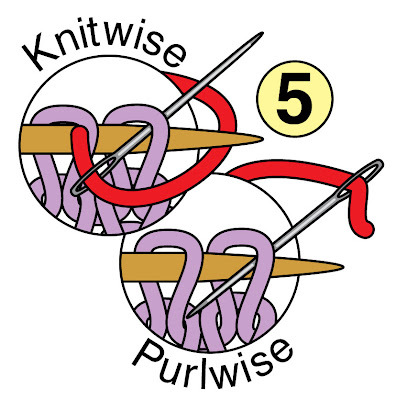 In 2/2 ribbing (k2, p2) try this on a swatch before you commit your sweater: you might think the resulting graft stiff and unpleasant. The downside of this next trick is that it’s not reversible, and not as visually good-looking as the double knitting trick. The upside: it’s reasonably stretchy, and it looks a LOT better than grafting with a 1/2 stitch offset. 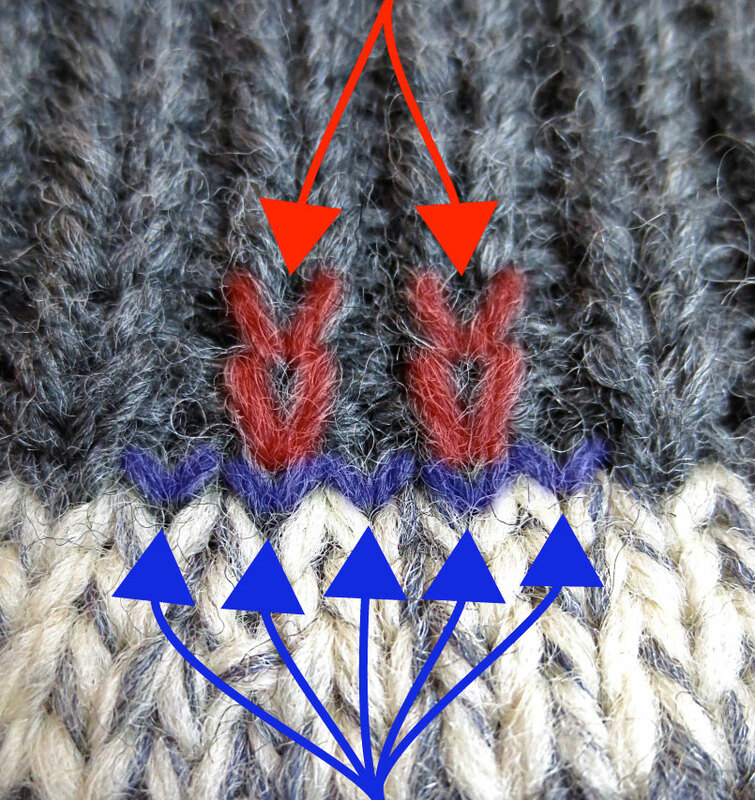 This trick takes Kitchener stitch back to its duplicate stitch roots (the relationship between Kitchener and duplicate stitch is discussed in this first post of this series). 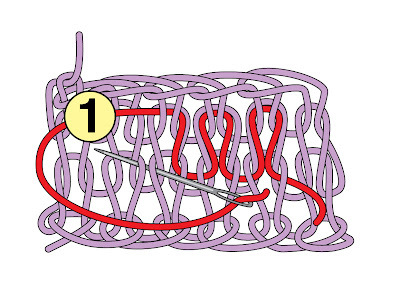 However, instead of using the threaded grafting needle to duplicate the path of a fabric which could exist, here we’re going to lie with our grafting yarn, and make up a path which could never exist in real life. This new path will disguise the offset. 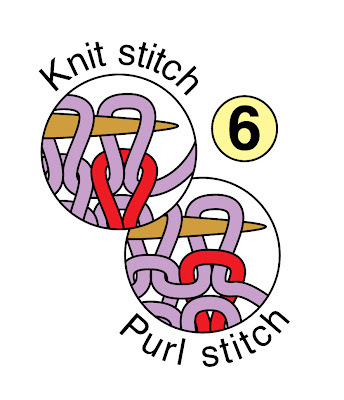 Per illustration 8, the purl and knit columns will line up with no offset. Bind off one of the fabrics to be grafted using the chain bind off. Lay the fabrics on a table, the bound off one upside-down and further from you than the one with the live stitches, as shown in illustration 8. Cut the running yarn of the bottom fabric (red) to a usable length and thread it onto a tapestry needle. 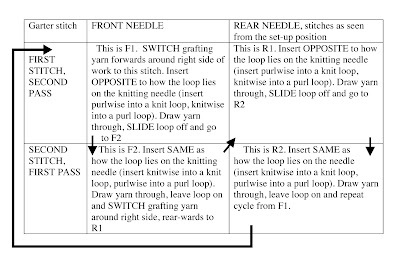 Switch the yarn up to the bound-off fabric, and work the tapestry needle under the two bind-off arms of the last stitch in the corresponding column, as shown in orange on the illustration. 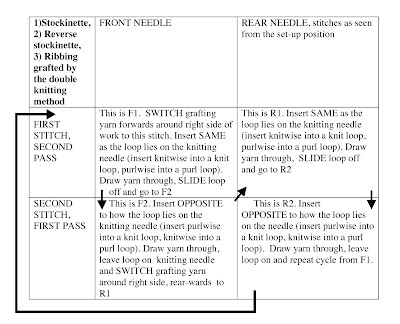 Bring the bind off yarn back to the lower fabric, to the same live loop you’ve already worked once, and thread the grafting yarn the SAME as that stitch lies on the needle (KNITwise if a KNIT stitch, PURLwise if a purl stitch). In short, you're Kitchener-stitching the bottom fabric--the one with the live stitches--normally, but for the top fabric--the bound off one--you're merely inserting the needle under the bound-off arms. 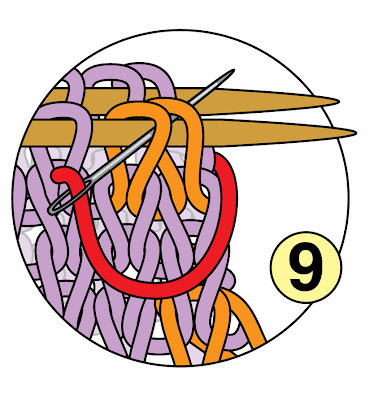 You’ll note that this method grafts a knit stitch in every purl column. 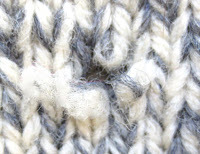 This is not ideal, but neither is it fatal—an all-knit row in a ribbed fabric is a common technique used to prevent the little dots (I call 'em "icky dots") which would otherwise show in the purl columns when changing colors between ribbing stripes. The results hardly show. Don't know which trick to use where? If perfection of graft is important, use the first trick--the double knitting graft. Also, this first trick is reversible--looks great from either side.